In Seattle, Boeing Co. employees tripled their cash donations this year to Northwest Harvest, operator of Washington's largest food bank. And every week, Northwest Harvest spokeswoman Claire Acey says, companies call to say their employees have decided to skip their holiday party and buy food for the hungry instead. "We see things like that and they are little beacons of hope," Acey said. Contributions to American charities have increased during 39 of the past 40 years in today's dollars, and a change in the tax laws - not the stock market crash - can be blamed for the drop in 1987, said Melissa Brown, associate director of research for the center. Between 69 and 72 percent of people give routinely, she said. Other research by the center has shown a connection between a drop in the Standard & Poors 500 stock index and a decrease in charitable giving, but the impact is less than 1 percent for every 100 points the index drops. Inflation and other economic factors can reverse the impact. Brown said the stock market has a relatively small impact on charitable giving nationally. In 2002, when the stock market was down, 70 percent of the population still gave an average of $2,000, she said. "It totaled billions of dollars and companies were going bankrupt and people were losing work," Brown said. Charities in New York, whose fates are tied more directly to the stock market, have been hit harder by a decrease in donations this year, but the national picture is more positive. A survey released this week by Federal Way, Wash.-based World Vision indicates that 2008 could actually be a better-than-usual Christmas for the nation's charitable organizations. The telephone survey, conducted in late October by Harris Interactive, found that seven in 10 adults plan to spend less money on holiday presents this year, but about half say they are more likely to give a charitable gift than a traditional present such as clothing or an electronic toy. World Vision hopes to take advantage of the giving nature of Americans with a holiday gift catalog where presents such as chickens and goats go to disadvantaged families in Africa and other parts of the world. "At a time when people have things and they know that other people don't, Americans' generosity wins out," said Justin Greeves, senior vice president of Harris Interactive, which regularly polls Americans about their charitable giving. The American Heart Association says donations are up this year, despite the economic downturn, and the Dallas-based charity is cautiously optimistic about holiday giving, said Suzie Upton, vice president for development. The American Red Cross is in the middle of a major fundraising campaign to make up for a lack of giving earlier this year - the organization's disaster relief fund was broke before hurricane season. 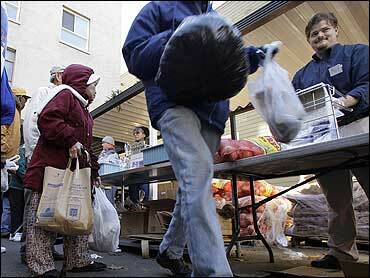 But Red Cross spokesman Jonathan Aiken doesn't blame the economic downturn for the charity's empty pocketbook. He blames the election. Aiken says America's focus on the presidential election took its eyes away from disaster relief for such things as hurricane relief in Texas and Louisiana. The Washington, D.C.-based charity's national campaign to raise $100 million passed the $60-million mark after two months. "We're pretty pleased with that," said Aiken, who could not compare the results with previous national campaigns because the organization does not regularly have them. Most of its income comes from spontaneous giving during national and international disasters. United Way of King County, Wash., which is one of the most successful United Ways in the nation, expects to reach this year's fundraising goal of $110 million. Volunteers say people seem insecure about the future, but they are also concerned about others and want to help, spokesman Jared Erlandson said. Erlandson credits the presidential campaign for helping to set a tone for this year's campaign. "People are fired up and they want to help right now," he said. Greeves, of Harris Interactive, said that in a year when people are having trouble meeting basic needs, giving by individuals usually increases food, shelter and health care. "If it makes them feel good and they feel like it's making a difference, they'll give money," he said.